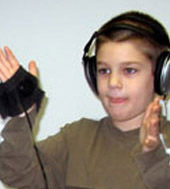 The Interactive Metronome Program is a concise, rigorous training program of temporal timing in the brain related to motor functions, though effecting academic changes. Treat children and adults with difficulties related to motor planning, sequencing, and auditory attention. Temporal timing is considered to be at a level of high integration, and best applicable after foundations of incoming processing has been effected to ensure a good “hold” on the clinical and functional changes.